My mom frequently emails me recipe ideas. The subject line might say something like, "to try?" or "thought of you." But when she sent me this recipe idea, it read "Home Run Pasta Salad." Cook the pasta according to the package instructions. Drain, set aside. While the pasta is cooking, in a large bowl mix the yogurt, mustard, lemon juice, salt and pepper, stirring well to full incorporate. Add the pasta to the sauce, and then top with the feta, mint/basil, cucumber and bell pepper. Serves 6-8 as a side, 4-6 as a main. Have you tried almond milk yet? You should. It is good, good-for-you, and a fun twist on milk. And while I am not a fan of soy milk, not in the least, this almond milk is good stuff. I recently started trying smoothies again. Almond milk in a smoothie? Superb. This smoothie recipe uses almond milk, but you could use whatever you want. Heck, with smoothies, you can pretty much put in anything you have on hand, even avocados. Yes, this smoothie recipe also uses avocados. I am not sure why I haven't ever used avocados in smoothies before, since they are delicious, full of good healthy fats, and about the smoothest thing you can imagine in your smoothie. Place in a blender. Puree. Mmm. Serves 2, 3 if you are feeling generous. On Friday I visited R's classroom to make individual pizzas with R's classmates. R and 3 others were chosen to help me cook, while the others "oooh-ed" and "ahhh-ed" with anticipation. Why pizzas? Well, a couple reasons. I had 30-40 minutes to make 21 items from start to finish, using any items I could bring from home. The school's teacher's lounge oven was available, as was a hot plate, but the bulk of the cooking and preparation had to be done in the classroom, on top of those little tables, with little chairs (I love those!). In other words, I needed something simple to prepare. You want to know something else? By using the roasted bell peppers to make the smile on these smiley pizzas, despite many kids saying, "I don't like peppers," every last pepper was eaten. Every one (unless someone pulled a fast one on me)! Let's here it for positive peer pressure, as the first kids to eat the pizzas were telling the other kids, "they're really good!" I felt like a mini-Jamie Oliver. Speaking of Jamie Oliver, despite Food Revolution being over, don't miss your opportunity to join in the revolution. Around a half a million folks have already signed this petition for better, healthier, natural foods in schools and to help encourage others to cook in the same manner. 2. You can now become a fan of Sweet Peas and Pumpkins on Facebook. 3. Cookbook giveaway is open until tomorrow at midnight. The farmer's markets are opening. Our sweet pea (plants) are growing in our garden. I just picked some amazing fresh collards from our yard. The CSA begins in mere weeks. Fresh, local produce is beginning to creep back into our kitchen. I love it! 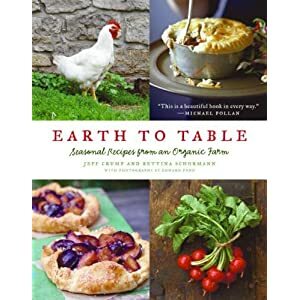 To celebrate the beginning of this growing season, I am giving away a wonderful cookbook, Earth to Table: Seasonal Recipes from an Organic Farm. This seasonally-inspired cookbook is "beautiful...in every way" according to Michael Pollan. I humbly agree, and hope you will too. Email me your favorite thing to grow at home or buy at your local farmer's market...and how you like to eat it! You have until midnight EST Friday, April 23rd. I will pop it into the mail to you, and you will be sure to be inspired. Be still my heart. 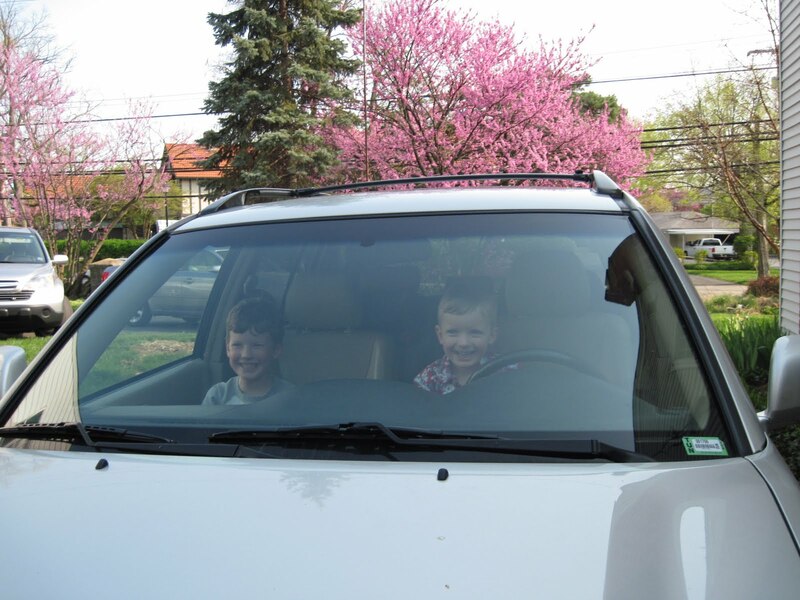 I know it will be a seeming blink of an eye and these two will be behind the wheel, of a real car, not one parked in our driveway! 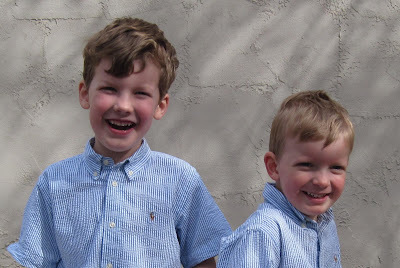 All you more-than-one child parents out there have probably suffered the same question I sometimes ponder: "does child #2 (or 3, 4, etc) receive the same attention as our first born?" I sometimes feel badly for G, and wonder if he is being slighted in this whole parenting deal. I spent a LOT of one-on-one time with R, for better or for worse. Not so much with G. Not that he is ignored, but I am just busier. Lots busier. And unless one of you knows better than I, I have yet to master being in two places at once. "First I will take some corn, beans and lentil soup..."
"add a few rainbow rings..."
"give it all a quick stir..."
Voila! The recipe for building up G's kitchen love! When you hear the word "taco," what image is conjured up in your mind? Is it a traditional meat-cheese-iceberg lettuce-diced tomato, perhaps with a dollop of sour cream image? Or is it something more like this? I grew up with the former image in my mind when I thought "taco," but have been nearly completely transformed into a taqueria style mindset. Taqueria tacos are authentic Mexican style--usually with the fillings served on top of two corn tortillas, topped with fresh chopped cilantro, onion, and pico de gallo or a perhaps a drizzle of chipotle cream sauce and squeeze of lime juice. Taqueria tacos taste fresher, are loads healthier, and go great with a big ole' side of guacamole (okay, anything goes great with guacamole). Place the steak or mushrooms in a medium bowl. In a separate bowl, mix the soy sauce through paprika. Pour the marinade over the steak or mushrooms. Let sit for at least 30 minutes before grilling or up to 4-6 hours. Grill up the steak or mushrooms. Once grilled, further slice to desired size for taco. Serve on two tortillas with desired toppings. I realized this weekend that this blog post would be a big milestone: my 500th (gulp). 1. I like to write. It's time to call my high school and college English teachers/professors and thank them for helping me learn this skill. 2. I consume a lot of time writing about food. Not sure how I feel about this. On one hand, I do like sharing my passion for cooking healthful foods with friends, friends of friends and, complete strangers. On the other hand, 500 hundred posts worth of time is a lot of *time*, time that could have been used for _____________. But then there are the days blogging doesn't seem so fun at all. Days when I don't care to write, or feel completely uninspired. Or when I write something I really, really love and I get a big goose egg in the comment sections. Or during a season when I just need a break from the kitchen. Overall, I feel like the first 500 days have planted a seed of fun memories, skills learned and time (hopefully) well spent doing something I really enjoy. Not sure if I will make it to another 500 posts, but for now, I am in awe of the sheer magnitude of posts listed in the right column. I have certain friends that, when they endorse and share a recipe with me, I immediately put it on my "must try" list. Friends whose food tastes have proven their worth time and time again that when they talk food, my ears perk up. And yes, of course I am talking about you. A good friend of mine, who I miss since we both moved away from DC, emailed me this recipe idea recently and it took me mere days before it was on the Sweet Pea table. SPH loved it. I loved it. The boys loved it. A true make-again. And so healthful too! Soften the cream cheese by either letting it sit out on the kitchen counter for about 30 minutes before you are ready to use it or popping it in the microwave for 20 seconds on defrost. Add the chives, mint, cucumber and salt, mixing well. Spread the cream cheese mixture on the bottom of serving dish. Top with hummus. Then top with the cucumber, olives, feta, tomato and red onion. Serve with pita chips. I have to type fast. G is on Spring Break this week and R has the day off from school. In other words, a busy mommy day here. So a quick update...several of you have emailed to ask me if I ate meat yesterday. I indulged in SPH's Smoked Salmon, Caper and Chive Cream appetizers, but despite the ham smelling really tasty, I just couldn't bring myself to eat it. I don't know, I don't know...we'll see where this is all headed. But for now, I am still meat-free. Simply spread a bit of the onions on toasted baguette slices. Top with a sprinkle of goat, feta or even blue cheese. Broil for a minute or two and top with the fresh herb of your choice. Delish, and like the theme of this post...fast! But alas, if you study the photos closely enough, you notice SPH, Jamie and yours truly all look a wee bit younger than we do now. 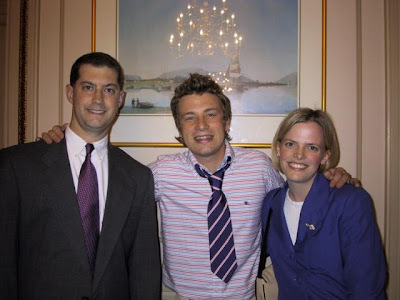 So I'll give it to you straight and say this photo is from years ago when Jamie came to where I worked to promote healthy eating. Many years later, my age has changed, but two things have not: I am still a huge Jamie Oliver fan and he is still talking about healthy eating. I am thrilled beyond measure about Jamie Oliver's new show "Food Revolution." If you haven't watched yet, check out the first two episodes on hulu.com and then set your DVR to record it tonight on ABC. I'll be watching along with you, cheering as he goes. Today's weather resembles a generous April Fool's joke. It should not reach 80 degrees this early in the season, but after last week's bad joke of a slushy snow, I'll take today's weather hands' down. G and I celebrated this beautiful weather yesterday by digging around in the dirt while R was at school. I'm already mulling over some new chive recipes with this over-abundance of fresh chives. It is officially the first thing to sprout in our garden (other than some perennial herbs), so it is a welcome sign of things to come. These chives were used in two applications for last night's dinner, as a fresh finish to some scrumptious caramelized onion and goat cheese toasts and in my Spring version of a "Garden Salad:"
Last autumn's pansies are awakening from the long winter, and since I was scavenging some fresh chives from our yard for the salad, I picked up some fresh pansies too. Didn't know that pansies are edible? They are. If you have access to some pansies (preferably organic--you don't want any hint of any chemicals from your yard), use them in a salad or better yet, a dessert and watch people "oooh" and "ahhh." Learn more about edible flowers at this website.